As the world’s population grows and demand for seafood increases, many seafood species are overfished or fully exploited. That means the world’s oceans cannot turn out more fish than are currently being produced. As the ceiling is being reached on seafood availability from the wild, U.S. producers of farm-raised seafood are working hard to help fill today’s growing demand for seafood in a sustainable way. Aquaculture is a process for raising aquatic species—both marine and freshwater—in a captive environment under controlled conditions. Agricultural Research Service scientists at the Grand Forks [North Dakota] Human Nutrition Research Center (GFHNRC) conducted studies involving one popular U.S. farmed fish, Atlantic salmon. They wanted to learn more about the omega-3 fatty acids in the fish. 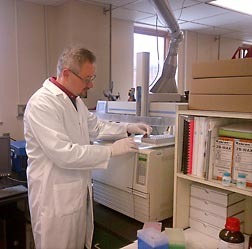 At the Grand Forks [North Dakota] Human Nutrition Research Center, physiologist Matthew Picklo performs fatty acid analysis of a sample of human blood plasma to determine the effects of salmon consumption. Two omega-3 fatty acids, EPA (eicosapentaenoic acid) and DHA (docosahexaenoic acid), are abundant in oily fish such as salmon, tuna, mackerel, and herring. Some data has shown that consuming 250 milligrams of EPA and DHA—the amount in less than 3 calories of polyunsaturated fatty acids (PUFAs) per day—is associated with reduced heart-disease risk. The GFHNRC scientists and their colleagues published two papers that examine the role of eating farmed Atlantic salmon as a means to increase intake of omega-3 fatty acids among consumers. The studies were led by GFHNRC nutritionist Susan Raatz and physiologist Matthew Picklo. They collaborated with William Wolters, who heads the ARS National Cold Water Marine Aquaculture Center in Franklin, Maine. “Atlantic salmon is an excellent source of EPA and DHA,” says Raatz, “and people can easily increase their consumption of omega-3 PUFAs by including more seafood in their diets.” These new studies provide data of interest to those who have concerns that farm-raised salmon has less available omega-3s than salmon caught in the wild. While eating seafood rich in omega-3 fatty acids is known to reduce risk of heart disease, it has not been known whether the baking process causes loss of omega-3s in farm-raised Atlantic salmon. The researchers at Grand Forks demonstrated that baking salmon to the proper temperature does not decrease the content of beneficial omega-3 fatty acids in salmon. 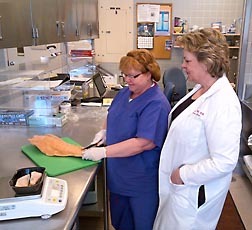 ARS nutritionist Susan Raatz (right) and cook Doris Zidon prepare farm-raised salmon fillets for a research study at the Grand Forks nutrition center. The researchers found that baking actually decreases the presence of fatty acid oxidation products. “Preparing the fish based on restaurant and safety guidelines—to a tender-but-safe 145°F—rather than overcooking to a tough, chewy fish was key,” says Raatz. The 2011 paper was published in the Journal of Agricultural and Food Chemistry. In another study, the scientists evaluated a group of 19 healthy human volunteers who were provided 3 different portion sizes of farm-raised Atlantic salmon. Each volunteer was assigned to consume two weekly servings of one of the three portion sizes of salmon for a 4-week period. After a “blood-clearing” break of 4 to 6 weeks, a different portion size was served, followed by another break, after which the third portion size was served, so that each volunteer had consumed all three portion sizes. The raw weights of the salmon portions fed to the volunteers were 90 grams (about 3.2 ounces), 180 grams (about 6.3 ounces), and 270 grams (about 9.5 ounces). The Institute of Medicine (IOM) and the Dietary Guidelines for Americans recommend consuming 8 ounces of seafood weekly, but at this time the IOM has not established a recommended dietary allowance for EPA or DHA. The results showed that EPA blood levels doubled after the volunteers consumed the 6.3-ounce portions and increased nearly threefold after they consumed the 9.5-ounce portions. Also, based on the blood indicators, DHA levels were elevated by about 50 percent, regardless of portion size. “We showed that consuming farm-raised salmon was an excellent way to increase omega-3 fatty acids in the blood to levels that corresponded to reduced heart disease risk,” says Picklo. The American Heart Association recommends consuming fish twice a week to reduce risk of heart disease. At this time, only the U.S. states of Maine and Washington produce farm-raised salmon, says Sebastian Belle, executive director of the Maine Aquaculture Association based in Hallowell, Maine. “On average during the past 5 years, Maine has produced about 26 million pounds of farm-raised salmon,” says Belle. 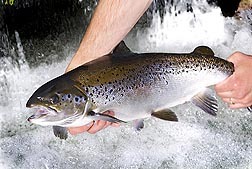 Significantly, in 2011, both U.S.-imported wild and farmed Atlantic salmon reached nearly 400 million pounds. The study was published in the Journal of the Academy of Nutrition and Dietetics in February 2013.—By Rosalie Marion Bliss, Agricultural Research Service Information Staff. Susan Raatz and Matthew Picklo are with the USDA-ARS Grand Forks Human Nutrition Research Center, 2420 2nd Ave., Grand Forks, ND 58202; (701) 795-8294 [Raatz], (701) 795-8380 [Picklo]. William Wolters is with the USDA-ARS National Cold Water Aquaculture Center, 25 Salmon Farm Rd., Franklin, ME 04634; (207) 422-2713. "Getting Hooked on Farmed Salmon: A Good Source of Omega-3s" was published in the May/June 2013 issue of Agricultural Research magazine.